Nice is a fun town. It’s a relaxed port and beach town. I thought Marseille would be more like this but it was too rough for my liking. Nice is much more chilled out and friendly tourist vibes in the old, heritage part of town where we stayed. Not as fab as Barcelona but still a nice atmosphere. The pebble beach was an experience. Walking into the Mediterranean Sea was tricky but fun. The trek out once my skin was all soft and sea-soaked was a lot more painful. I gave up on trying to keep my dignity and crawled out of the water - it was really slippery where the waves broke on the pebbles. Suddenly, the locals wearing full foot-covering water shoes made sense. The water was divine though. I spent most of my time not swimming and just floating on my back, looking up at the clear blue skies and being rocked by the waves while I listened to the sound of pebbles swaying to the water. I can feel my shoulders relaxing just remember this moment of bliss. The city itself is fun to walk around and explore in. The buildings are colourful and bright, the esplanade by the beach stretches as far as the eye can see. There is a massive park called the Jardin Albert-Ier right by the main esplanade with statues and water features - we walked through it twice, once during the day and once at night to make the most of it. We slept terribly in Nice because we were in an old apartment and could hear all the noise on the streets where people partied until 5am or 6am each night we were there. It’s definitely a good place to holiday and party. 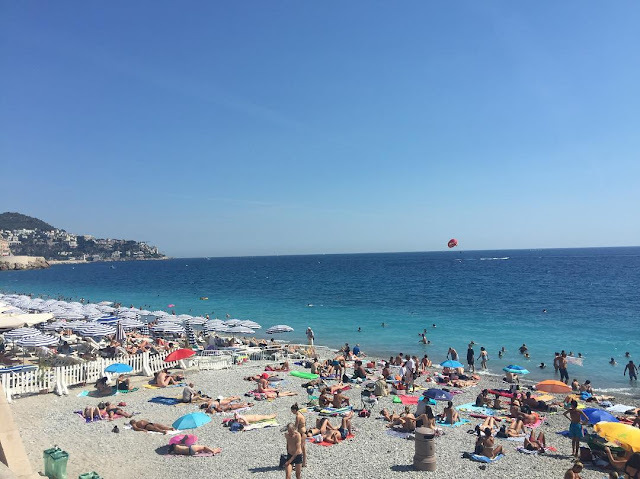 I can see why Parisians head to Nice when they want a beach trip.